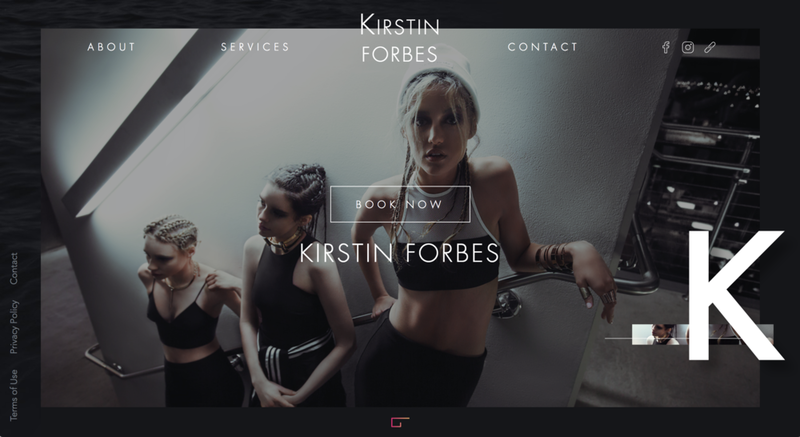 Our Personal Site of this Week is Kirstin Forbes’s. About Kirstin: Kirstin is a #GlossBoss who has been honing her craft for over seven years. She experiments with a variety of styles from high fashion to street. She has created a partner business, pop-up shop Artistry Entrepôt's Beauty Room in downtown Anchorage, and is cultivating her personal brand and business, Kirstin Forbes Hair. She specializes as a Colorist and was featured on Buzzfeed back in November 2015. It’s consistent with branding: Kirstin is a hair stylist who creates high fashion and street fashion looks. This photo is a perfect blend of both. It highlights Kirstin’s specialty: The highlight of the photo is the hair, Kirstin’s specialty. The tight braids and dark coloring give the photo the perfect edge to convey Kirstin’s style as an artist. Kirstin already had a personal site that she uses to display her extensive portfolio and set of client photos. However, Kirstin was able to easily use the personal online booking site to improve her original website. When you click book on her personal site and then “book online,” the site links to the GlossGenius booking site. With her online booking site, Kirstin doesn’t have to be available for calls to book appointments at all times. Instead, clients can see her availabilities and choose what time works best for them! Want to set up a personal booking site like Kirstin’s? Sign up for your free 14-day trial of GlossGenius here!